Garry Monk put his squad through a training session at Elland Road yesterday as the Leeds United head coach prepared for his first home game in charge. United’s players swapped their usual Thorp Arch base for the club’s stadium yesterday morning, continuing their build-up to Saturday’s friendly against Atalanta and the start of the season in 10 days’ time. Gaetano Berardi took part in the session having overcome the minor injury which kept him out of all of United’s four pre-season games to date. 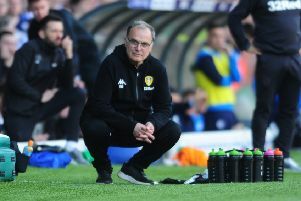 The right-back was hurt during Leeds’ tour of Ireland but returned to training on schedule this week. Centre-back Liam Cooper remains on the sidelines with a slight calf tear. Atalanta are the opposition for United’s only home friendly, traditionally staged on the last weekend before the new season begins. The match will see Monk’s first appearance in the home dug-out since he was appointed as head coach at the beginning of June. Atalanta are in the early stages of their pre-season and do not start the Serie A campaign for another three weeks. Meanwhile, winger Jordan Botaka is the subject of a number of loan bids, the YEP understands. League One side Oldham Athletic, who have already taken Lee Erwin from Elland Road on a temporary basis, are among the clubs who want to sign Botaka ahead of the new season. Botaka has a year left on his contract at Leeds and was hopeful of making a bigger impact this season after struggling to hold down a place last term. Players like Stuart Dallas, Hadi Sacko and Kemar Roofe appear to be ahead of him in the order under Monk and Botaka did not make the squad for last Saturday’s 2-1 defeat to Peterborough United. As Monk awaits further additions to his senior squad, United are working to recruit two players for their development squad. The club are negotiating deals with former Reading midfielder Conor Shaughnessy, who scored in an Under-21 friendly against Tadcaster Albion last week, and Doncaster Rovers midfielder Billy Whitehouse.